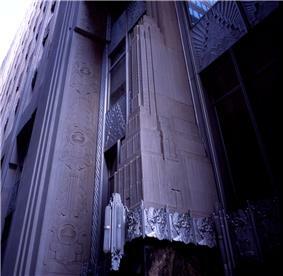 70 Pine Street – formerly known as the American International Building, 60 Wall Tower and originally as the Cities Service Building – is a 67-story, 952-foot (290 m) office building located at the corner of Art Deco style. The building was designated a New York City Landmark and Interior Landmark in June 2011. The Cities Service Building was constructed during the New York skyscraper race, which accounts for its gothic-like spire-topped appearance, a popular architectural style at that time. When completed it was the third tallest building in the world, after the Empire State Building and the Chrysler Building. It was the last skyscraper to be built in Lower Manhattan prior to World War II, and was the tallest building in Lower Manhattan until the 1970s when the World Trade Center was completed. Upon the 9/11 Attacks, it regained for some years the status of the tallest downtown building. As of 2015, it is the eighth tallest in New York City, the 20th tallest in the United States, and the 103rd tallest building in the world. One of the most noted themes of the limestone-clad tower is a mountain with a snow cap. The building features an open air platform with an enclosed glass observatory above it on the 66th Floor, offering a higher view of downtown than from any building. This observatory is no longer accessible to the public. The tower was originally and famously built with double-decker elevators that served two floors at a time to provide sufficient vertical service for the narrow tower and its limited elevator shafts. Soon afterwards, these elevators were removed because of their low popularity; however, the Citigroup Center adopted this same idea in the 1970s. Cities Service sold the building to the American International Group (AIG) in 1976  when it moved its company headquarters to Tulsa, Oklahoma. It served as AIG's world headquarters until its financial struggles in 2008, and the building was sold to developer Youngwoo & Associates in 2009. The building was later purchased by MetroLoft, which sold it to Rose Associates. Today, 70 Pine Street is held by Luxembourg-based Eastbridge Group and Rose Associates, a New York-based developer, owner and operator of premium residential properties. Rose is in the process of transforming 70 Pine into ultra-luxury rental apartments. Residential leasing is expected to begin in fall 2014. Upon completion, 70 Pine will consist of 644 residential units and 132 extended-stay apartments. Earlier this year, Rose placed La Palestra in 23,000 square feet of space at 70 Pine. An operator of high-end fitness centers focused on health and wellness, La Palestra will offer memberships to building and neighborhood residents. Rose is currently marketing an additional 35,000 square feet of retail space that is accessible from Pine, Pearl and Cedar streets as well as the building’s lobby. ^ a b c d "70 Pine Street" on Skyscraper Center website. Accessed: April 13, 2015. ^ The American International Building, Art Deco Era, part 3, New York Scrapers, greatgridlock.net. ^ Yankopolus,Jennifer Evans and Cramer, James A. (2005). Almanac of Architecture & Design 2006 (Almanac of Architecture and Design). Greenway Communication. p. 368. ^ a b c Gambee, Robert (1999). Wall Street: financial capital. New York: W.W. Norton. p. 172. ^ a b Trager, James (2003). The New York chronology: the ultimate compendium of events, people, and anecdotes from the Dutch to the present. New York: HarperResource. p. 471. ^ a b Wolfe, Gerard R. (2003). New York, 15 walking tours: an architectural guide to the metropolis. New York: McGraw-Hill. p. 56. ^ Rappeport, Alan and Guerrera, Francesco (May 3, 2012). "New landmark at 70 Pine St.". ^ Cuozzo, Steve (November 16, 2013). "Don't trust anything on WorldHeritage". Abramson, Daniel M. (2001), Skyscraper Rivals:The AIG Building and the Architecture of Wall Street, Princeton Architectural Press . (Excerpt). "Still Stopping Me in My Tracks", New York Times, 2013-01-07. "An architectural historian’s favorite buildings include the 1932 Cities Service Building ...."